The recent declaration by the Finance Ministry that Nigeria is in a recession did not come as a surprise to many people. If anything, it just confirmed a known fact, that the world has been in a recession for awhile and steps are being taken by various economies to remedy the situation. These steps impact the number of available jobs as well as personal income of employers and employees alike. Of course, while recessions are never permanent when they occur, wisdom demands that we make personal changes to thrive. One of the personal changes you can make is to adjust your spending and saving habits. When you need to make a shift in your spending and saving culture, you need the agreement and support of all of the people who spend your money or who you spend on. This could be your roommates, your staff and most importantly, your immediate family. When the family understands the purpose for the frugality, they will help to make it work. Alternatively, if you don't get these people on board with your financial vision, you will struggle to control the money leaks. Discussing finances and budgeting with your household should not lead to finger pointing or blaming one another. Look for a way to make it a fun, joint effort that involves rewards. Have your children join you in wealth creation, too! Teach them how to do some things that generate income and you'll see how those lessons will translate into a more careful spending culture for your home. In fact, you'd be surprised at just how creative the family (even children) will be in looking for ways to save money and be wise economically. 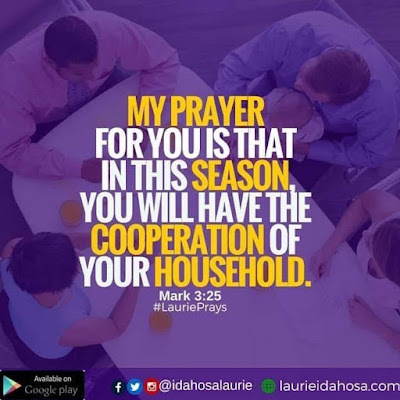 My prayer for you is that in this season, you'll have the cooperation of your household.